I’ll be the first to admit that when I heard of the idea of curry pumpkin soup, I thought it sounded dreadful. Pumpkin soup? Are you kidding? My wife really wanted to try a curry pumpkin soup recipe she found in our copy of Mark Bittman’s How to Cook Everything Vegetarian, though, and we often eat each other’s culinary experiments. I was shocked when I found out the soup was good. I was doubly shocked when my wife modified it a bit and the second version was bordering on great. The soup is the main attraction here. 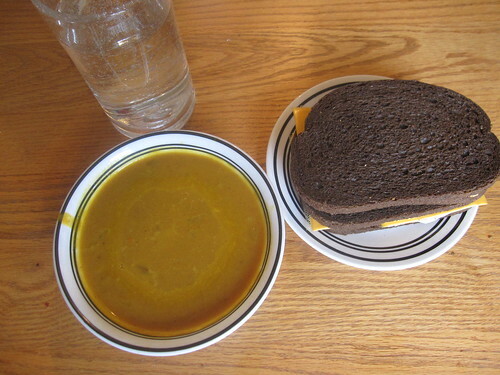 We just accompany it with a simple sandwich or two to dunk into the delicious soup (in this case, pumpernickel sandwiches with cheese and some leftover salad spread on them). Most of this stuff is easily acquirable at any local grocery store. This was about $7 worth of ingredients for us and it made enough soup for eight adult meals. The best thing to do in advance is to chop the onion, then store it in a sealed container in the refrigerator for use in the recipe. There’s really nothing else to do the night before unless you’re preparing fresh pumpkin, fresh coconut milk, fresh ginger or fresh garlic for use, in which case it can be quite helpful to prepare those elements as well. I highly recommend doing the fresh ginger and fresh garlic, though, as they don’t take long and really add to the meal. Simply saute the onions over medium heat in a large saucepot (capable of holding at least three quarts) with the vegetable oil until they begin to be translucent. At that point, toss in the garlic, ginger, and curry and keep sauteing for another two minutes (or until your kitchen begins to smell wonderfully). Add the pumpkin, coconut milk, and stock directly to the pot and stir continually until the liquid is bubbling. At that point, add the cayenne, salt, and pepper and stir, then allow it to simmer for five minutes (or a bit longer if you need to for other meal preparations). This is a fairly hearty soup, so sandwiches are a great side to serve with it. The biggest variation you can make with the soup itself is to add 1/2 cup chopped cilantro to the soup. This adds an unusual flavor to the soup that some will really like. However, most of your options with this meal come from the sandwiches. Mix it up a little with a variety of breads (rye, pumpernickel, potato, etc.) and toppings of all kinds (different meats, cheeses, condiments, and so on). Sandwiches can provide limitless flavors, so experiment here.